 Vocal jam based on "pubic hair in your Coke." Two Charlie Chan signals and Simpsons and Oom Pa Pa signals in intro. Chalk Dust contained Charlie Chan and Simpsons signals and the David Bowie intro contained two Charlie Chan signals as well as Simpsons and Oom Pa Pa signals. There was also a quick Dave's Energy Guide tease by Trey near the end of the song. 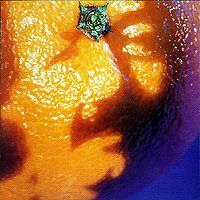 The YEM vocal jam was based on "pubic hair in your coke," a reference to the day's earlier testimony by Anita Hill in the Clarence Thomas hearings. Adeline was performed without microphones. This was my first time seeing PHiSh live. 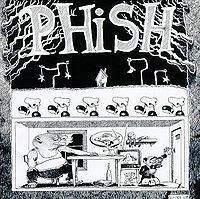 To know about PHiSh in Seattle in 1991 meant you were well connected in the tape-trading culture, or you knew someone who went to college in the northeast. I had a tape God friend who clued me in on the coolest band of the '90s with several crisp soundboards of PHiSh shows from 1990. 4-22-90 and 10-31-90 were my first 2 full shows courtesy of the afore mentioned tape God. Along with the tapes came some advice: They are coming to play the Backstage in October 1991 - DO NOT MISS IT. I heeded this advice and showed up to my favorite club in the funky old seawater-scented Seattle neighborhood of Ballard. Paid cash discount at the door as did most of my friends, and got in 15 minutes ahead of door time. Snagged best seat/table dead center overlooking the dance floor. First thing I noticed was a lot of Tie-Dyed and Grateful Dead T-shirts on our kind of people. The Place was filled with around 400 bodies, and it had to be right at full - strange I thought - for an unknown band from VERMONT... The music on my tapes told me of the influences on the members of this band. I heard the typical things - Zappa, Prog Rock, a Psychedelic sensibility, all wrapped up with an educated mindset and a twisted sense of humor. They seemed to play *with* music in a sense of child-like wonder at the limitless possibilities. (Big Ball Jams were an example). I had gained a passing knowledge of some recognizable songs like Bouncing, Llama, Lizards, and others like Foam and Stash had yet to really find their places in me. Well this live set put me on a direct course with PHiSh headed out to Gamehendge. My Sweet One ("and if your dog or cat ever dies, I'll buy you a Ewe" - priceless). 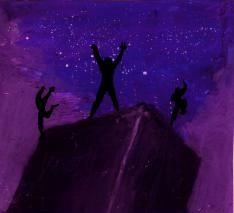 Up next was Divided Sky which eventually came to be a powerful representation of essential PHiSh. The band sounded HUNGRY for new listeners, and TIGHT from long stretches of non-stop touring and rehearsing. The "Somewhere over the Rainbow-esque" figures around the break were beautiful: familiar yet new - a theme which would continue as I dug deeper into their material. Trey's soaring PAF-ish leads in the Sky outro had me instantly. Where had this band BEEN all my life? Quirky Geulah Papyrus occupied a space all it's own. 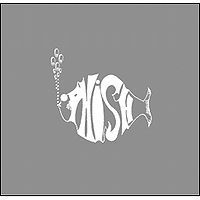 Music without a category: it's just PHiSh. "Expanding exponentially like some recursive virus..." who the hell else had words like that to music like *this*? It took a King Crimson to get this kind of reaction out of me. Chalkdust Torture was a relatively new piece that straight ahead ROCKED, yet never lost the oddball character of the band. I was growing gills quickly. A Simpson's theme "secret" riff popped up in the jam and the band + a few fans yelled out "D'OH!" Another perfect move. You Enjoy Myself - what can I say? Well I knew the intro from my tapes and those of my tape God. Then it seemed to go it's own way on a white-funk adventure. I was hearing elements of the Progressive Rock I grew up with like Yes, Crimson, Genesis - but never overt - more like implied and they knew how to use restrainti paying homage. They were wrapping me up in the daily paper and getting me ready to be filleted. WAAAAAAAA... BOY! MAN. God. Sheeeeeeit... The vocal jam was called "A pubic hair in your Coke" by Anastasio. The song I had been able to sing along with came next - Bouncing Around the Room. I thought it to be nicely crafted and fun. Runaway Jim was another I felt like I knew already, but the extended jams easily sent me off into a "what song was this?" space cruise. ***Nice set of music there - and the packed dance floor was in constant motion. Not like a typical "whatever" concert crowd that's too cool to appear having fun, these people were letting the music move them around. Played with focus and purpose all the way through - I detected no weakness, or hesitation. They were on a *mission*. The Curtain - here we were again mining Prog Rock quarries looking for totally new gems. Cavern was another new song that had a fun sing-along outro that was easy to ad-lib over. (A penile erector..) So far there was not one piece that had me drifting towards boredom -NO! It was a sensory smorgasboard. Foam - this odd song with it's descending riffs and staccato vamps really felt strange to me - like the first time I had Mediterranian food. It wasn't *bad* it was just so very different that it took some time to get familiar. The jam out of the song structure then took me on it's wings and flew me high. It wasn't long before I'd be disappointed they didn't play Foam as often as they had back then. David Bowie. I had no idea what this was, but it had me once again in Prog Rock ecstasy, and the wild ending... I had no idea this music existed. The Mango Song -it would be several more years before I got a handle on this one, but the accessible, endearing melody made it comfortable to lean on or take a nap in - like a sturdy hammock. A dark and heavy Sloth further fortified my view of this band's wildly wide range of material and styles. Poor Heart, Magilla, Possum ... whoah - again with the stylistic divergence yet no trace of discomfort in moving around and about like this. So many rock bands have a limited dimension whereupon all songs sound kinda the same. Not so this PHiSh. Luckily, I had been prepared with a background of adventurous music from Zappa to the Grateful Dead, Bluegrass to jazz-Fusion, modern Symphony, and music from other planets. 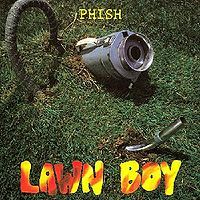 To further hammer the point home, the encore was a double of acapella Sweet Adeline - purty as can be like a Barbershop Quartet - then slammed into BBFCFM (look up yer acronyms kids) which can only be described as PHiSh's attempt at PSYCO-PUNK homicide-rock. Sadly, of set 2, only Bowie and Mango are available in circulation. The set 1 and 2 tracks of set 2 are solid sounding SBD recordings - a great listen every time. I do hope that someday Kevin Shapiro discovers the missing tracks, but I suspect it was lost at the source. It's a rare show, and attendees were also rare. I like to think the band had a good time in our little corner of the country. Without realizing who it was - I did get to briefly see Trey's beloved dog Marley who was right by the entrance to the venue in one of the 2 vans the band was still using to schlepp across the country before the record deal earned then real Tour Busses. I had just recently moved from Albany, NY to Seattle about one month prior to this show. Blues Traveler had played RKCNDY the prior week. I ran into Mike having a smoke out front and intro'd myself and we chatted for about 15 minutes before he headed back into to prep. It was so great to be in a totally unfamiliar town and hang out with folks who were so psyched and grateful to see Phish. I remember running into a guy in the Men's room after the show that told me he had decided to go down the Olympia and then join the rest of the tour during YEM. Oh and I'm the loud guy that was yelling 'Creature' after Sweet Adaline. I caught Mike's eye and then they blazed it. Anyone have the bootleg?